Great purschase! 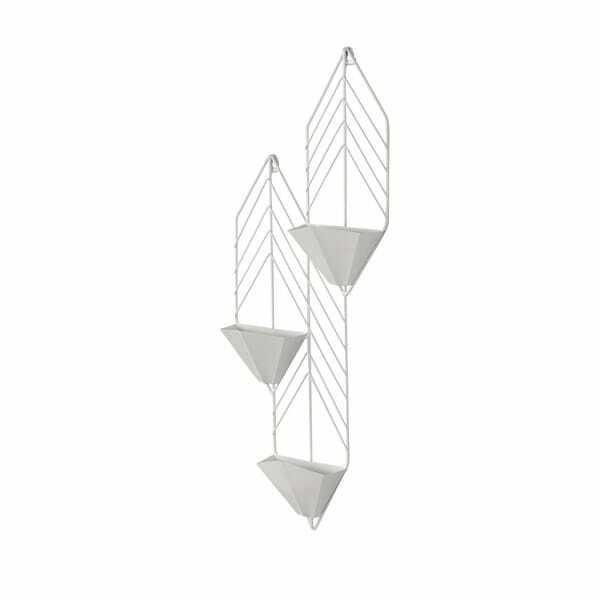 The metal is lightweight and easy to hang! It is smaller than it appears. But, it actually works well in the corner of my office. I would purchase again. Create an innovative garden design with this geometric metal wall planter. Offering a glossy finish, this planter comes with all the hardware you need for easy installation. I really like the look of this planter. I planted 3 aloe plants in it. The only negative is small openings in the metal of the actual planter where water can seep out. I also spray painted it a gun metal color to match my decor. Much more tiny in person than you think it will be, but it is very cute. The pockets aren't completely sealed on the bottom, so be aware of that before you plant anything in them. You can probably fit a 1-3 inch wide plant in each pocket comfortably. Looks so cute with the air plants I have put in them. This hangs well on my fireplace and looks great. It’s a sturdy piece of metal, not flimsy at all. Gave this as a gift. The person who got it told me they love it. I thought that there were actual chains on it but the whole thing is just one piece of metal I think it will look really cute with plants on it. The product looks amazing in person than the picture. Also its really much bigger than what I expected. Although overstock missed one package, I am still satisfied with the product. Hoping to get the missing part so I can start decorating. Great decorative piece for any room in the house. 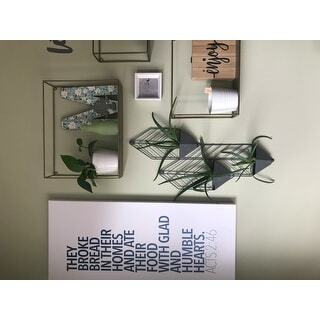 Fits three small plants and adds pop to my wall. Really awesome decor..perfect with air plants.however was much taller than i expected,my bad though for not reading description.still really awesome for my wall.love it.arrived very quickly. This is a great piece. It fits in well with modern decor. Glad I purchased it. It’s everything I hoped it would be! The gold looks cheap up close. I wish I had ordered the black. However the design fits well with my mid century modern decor.